(09-03-2017, 10:59 AM)MarcoP Wrote: You are not allowed to view links. Register or Login to view. (09-03-2017, 09:32 AM)ReneZ Wrote: You are not allowed to view links. Register or Login to view. The illustration on You are not allowed to view links. Register or Login to view. allows an interesting comparison with an image in one of the Wellcome copies of the "Buch der heiligen Dreifaltigkeit": WMS 164. (Apologies if I mentioned this before). On the left is a 'sun plant' and on the right a 'moon plant'. Especially the moon plant has a decent superficial similarity with the Voynich MS plant. The plant on the right in You are not allowed to view links. Register or Login to view. indeed has some similarity with this specific "Lunaria". I don't think the VMS plant on the right is Lunaria (either the real Lunaria or the mythical one). 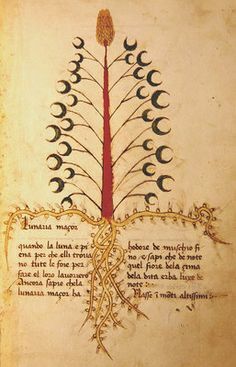 In medieval manuscripts, mythical Lunaria is almost always drawn with a central stalk with the moon- (luna-)shaped leaves running up each side. The ones that follow the myth most closely will often have one "leaf" for each day of the moon's phase. Teasel has upturned leaves that are often depicted like "cups" and in real life the leaves of cut-leaved teasel do look like cups and catch moisture. Not bad, JKP. Now, to make sense of what the root means. The shape, size and color all look rather deliberate if you ask me. (09-03-2017, 12:26 PM)Koen Gh. Wrote: You are not allowed to view links. Register or Login to view. Not bad, JKP. Now, to make sense of what the root means. The shape, size and color all look rather deliberate if you ask me. And there are several kinds of teasel. Fuller's teasel (the one with the big heads) was used by weaving factories to card the wool, even after the industrial revolution! So... one explanation for the big roots (besides them being somewhat naturalistic) is to indicate to the viewer that this is one of the smaller teasels (not Fuller's teasel used in the woollen mills but maybe cut-leaf or another teasel). Many herbals include two, sometimes even three kinds of teasels. Not sure if that's the explanation, but it's a possibility. If this is meant to be Fuller's teasel, then another possibility is that the root is a big hank of uncarded wool (uncarded wool is lumpy and stringy) and the root isn't just big, as in nature, but is mnemonic. If teasel was used for weaving then the mnemonic actually reinforces your ID. What about the leaves' menemonics. In Pritzel, could not find anything appropriate. The leaves remind horns to me, they don't look like cups, IMO. Any other suggestions? In my opinion you'll find root mnemonics in the majority of plants but leaf mnemonics are less common. It might be that these leaves are just stylized versions of what they really look like. Or perhaps made to look exaggeratedly like cups reinforced by certain linguistic cues. It's hard to tell without knowing the linguistic background. I'd be happy to find root mnemonics here, but I don't succeed (speaking of the right plant in the folio). The root looks commonplace, doesn't it? That root is definitely mnemonic. A special color was even prepared for it, which is something they won't do for a standard root. Again here I must say that JKP's suggestion would explain this, since one could say this color is meant to approach that of raw wool. If the message behind the mnemonic is "this is equivalent to wool", then it would also explain the leaves. In some of them the edges look like ram's horns, and the edge looks woolly like a sheep. (09-03-2017, 02:46 PM)Anton Wrote: You are not allowed to view links. Register or Login to view. The leaves remind horns to me, they don't look like cups, IMO. I think the illustrator has done his best to make the leaves look like cups. Unluckily, his work was spoiled by the splash of green color. I find JKP's collection of images quite informative. The Voynich illustration seems to me to sit well between illustrations of Dipsacus in You are not allowed to view links. Register or Login to view. (Camelleunta Nigra, Dipsaca, which is substantially flat) and You are not allowed to view links. Register or Login to view. (who successfully renders the three dimensions with the careful use of lighter and darker green). 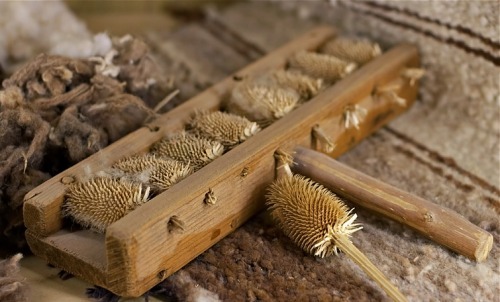 Apparently dried teasels were (and sometimes still are) used for "raising the nap" on woolen fabrics - part of the manufacturing process. An interesting side note is that the wool was made wet beforehand, which might be the reason for the strange color used in the root. So I would most definitely prefer a type of teasel that was used in the manufacture of fabrics. This also points to some thematic grouping, since the plant to its left is cotton.